Men's swimmer Tanner Sonnek (Sr., North Mankato, Minn.) and all-around gymnast Amanda Malo (Sr., Greenwood, Minn.) have been selected as the Gustavus Adolphus College March Male and Female Student-Athletes of the Month, presented by Thrivent Financial and voted on by the Gustavus Sports Information Department. 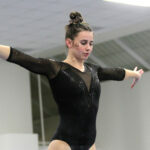 Amanda Malo (Sr., Greenwood, Minn.) was named the National Collegiate Gymnastics Association (NCGA) West Region Gymnast of the Year, which was announced Wednesday morning. Three Gustavus gymnasts Saturday competed at the NCGA Championship at UW-Oshkosh and brought home three All-America honors. Gustavus gymnasts Sam Ardy (Sr., Thousand, Oaks, Calif.), Amanda Malo (Sr., Greenwood, Minn.), and Brook Merila (Fy., St. Michael, Minn.) are set to compete at the NCGA Championship on Saturday. The national meet begins at 4 p.m. at the University of Wisconsin-Oshkosh. Two members of the Gustavus gymnastics team were selected to the 2019 National Collegiate Gymnastics Association (NCGA) All Championship Team following the conclusion of the two regional meets on Saturday afternoon. Both Sam Ardy (Sr., Thousand Oaks, Calif.) and Amanda Malo (Sr., Greenwood, Minn.) were selected for the bars, while Malo was also selected for the floor. 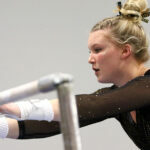 The Gustavus gymnastics team took sixth place at the WIAC/NCGA West Regional on Saturday at the University of Wisconsin-Stout, accumulating a total of 184.725 – the second highest mark of the season. Host UW-Stout won the meet with a 190.225. The Gustavus gymnastics team Friday wrapped up its regular season with a 185.550-183.800 loss against UW-La Crosse at the Sponberg Gymnastics Studio. Amanda Malo (Sr., Greenwood, Minn.) highlighted the meet for the Gusties, tying for first on the floor with a season-high 9.700. The Gustavus gymnastics team won its first home dual meet of the season Friday, defeating Hamline 183.725-180.325 at the Sponberg Gymnastics Studio. The Gustavus gymnastics team Friday night hosted its home opener and scored a season-high 184.775 in a WIAC dual loss to UW-Stout. The 184.775 score is the sixth-highest team total in program history. 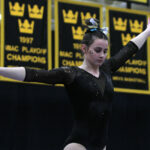 Gustavus senior Amanda Malo (Greenwood, Minn.) has been named WIAC All-Around Gymnast of the Week for her performance at UW-Eau Claire last Saturday. This is Malo’s second consecutive WIAC Gymnast of the Week honor and third this season.